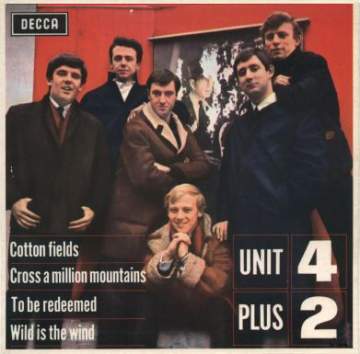 The east Hertfordshire based 'Unit Four Plus Two' had originally been formed as a four piece (Unit Four) by the former lead guitarist of the Hunters, and member of Adam Faith's Roulettes, Brian Parker. Parker dropped out of the original line up (Parker, Moeller, Meikle, and Moules) because of failing health, but stayed in the background. The band's style was closer to folk music than 'progressive beat', but they gained a recording contract with Decca. Their singles were largely ignored and failed to make the chart until Parker produced the song 'Concrete and Clay'. This was untypical of the material the band had been working with and two of Parker's former colleagues from the Roulettes (Russ Ballard and Bob Henrit) were drafted in to boost the rhythm section. The resulting record was a smash hit in the UK and managed #28 on the other side of the Atlantic. The EP illustrated here, Decca DFE 8619 is the only one issued for the group during the 1960s.Although it sold in reasonable quantities, it is much sought after and now quite difficult to find. Sadly, the group were unable to consolidate this success, despite recording some quite good songs including some written by the talented Russ Ballard who would achieve further fame with Argent and as a solo artist in later decades. However the band struggled on until they disbanded during 1969. See Lower list for UK EP releases.